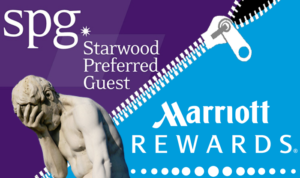 Are you in either the Marriott Rewards or Starwood Preferred Guest Program? Don’t make a decision about what to do with your points until you read this. To get straight to the point, I recommend keeping your points where they are. If you were a Marriott member, don’t transfer your points to SPG. Were you with Starwood? Don’t transfer to Marriott. If you happened to have been a member of both like, I am, go ahead and link up your accounts, but don’t transfer points, at least not yet. You don’t have to worry about your points expiring. As long as you keep some transactional activity with either chain, even if it’s only non-hotel purchases, your points will remain active. Generally speaking, travelers consider SPG to be the better brand, even though they owned fewer properties. SPG members were concerned that their higher points per dollar would be diminished. Because there’s almost always a Marriott property where you might be traveling, a lot of people have accumulated points with them. 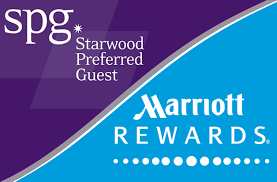 The worry for people who are Marriott only members was that it might have cost them a lot more to stay at a similarly-profiled hotel in the Starwood portfolio. Many people, including me, were fretting over what the merger would mean. Many times, when a merger happens, or when a travel company changes the terms of their rewards program, they take away some of the goodies. They make it harder to qualify, to retain your points, or limit where your points can be earned or used. For example, hotel chains regularly change the categories of hotels, moving them up and down the ladder. That has a direct effect on how much a “free” night will cost you, when you choose to pay with points. The latest news is that the hotels are choosing to keep the rewards programs separate. They have yet to figure out which brands, including the higher-level categories, will be merged. That could take years to ease apart. It might also affect the category level of some of your favorite places to stay. In the face of this uncertainty, the best thing to do is to preserve your points where they are now. Share this post with your travel buddies! Happy traveling!